— Submitted photo Three young women from Webster City High School will take part in the Iowa Ambassadors of Music tour to Europe. McKenna Mitchell, Ursula Leksell and Kyra McKee will join nearly 400 other students on the tour. 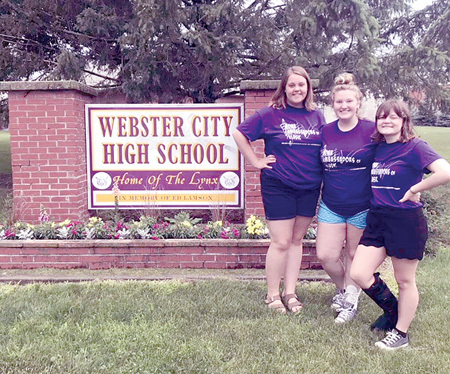 The local participants are: McKenna Mitchell, 2018 graduate of WCHS and daughter of Ted and Janet Mitchell of Webster City; Ursula Leksell, a 2019 graduate of WCHS and the daughter of Heidi Leksell Denekas of Ellsworth and Ron Corbin of Webster City, and Kyra McKee, a 2018 WCHS graduate and the daughter of Don and Kristin McKee of Webster City. The tour starts with four days of rehearsals in Grinnell and a farewell concert July 2 at 7 p.m. at the Grinnell College. Following the Concert the Ambassadors leave for Chicago by bus and fly to England, France, Switzerland, Germany, Austria, and Italy. To be considered for membership in IAM students must be recommended by their music teachers for excellent music skills and strong character. After the initial recommendation by their high school music instructor Andrew Witherspoon, the students are contacted about participating in the tour. These girls, who have worked to pay their own way on the tour, will perform in the 150-member choir. This will be the 16th trip made by the ambassadors since it was founded by Morgan Jones, Professor Emeritus from the University of Iowa in 1988. William Carson of Coe College conducts the IAM Band and Lee Nelson of Wartburg College conducts the choir. Some 40 Iowa music teachers assist in the musical preparations and serve as advisors on the tour.